Researchers have demonstrated a tiny chip based on silicon that could be used to diagnose dozens of diseases. A tiny drop of blood is drawn through the chip, where disease markers are caught and show up under light. The device uses the tendency of a fluid to travel through small channels under its own force, instead of using pumps. The design is simpler, requires less blood be taken, and works more quickly than existing "lab on a chip" designs, the team report in Lab on a Chip. It has a flexible design so that it could be used for a wide range of diagnostics. Much research in recent years has focused on the chemical and medical possibilities of so-called microfluidic devices at the heart of lab-on-a-chip designs. 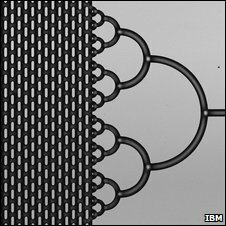 These microfluidics contain between dozens and thousands of tiny channels through which fluids can flow, and as micro-manufacturing methods have advanced, so has the potential complexity of microfluidics. Now, scientists at IBM's research labs in Zurich have developed a cheap lab-on-a-chip that has the potential to diagnose dozens of diseases. "There are devices that have been developed in microfluidics to do analysis of proteins, but most of them use active pumping and electrical components," said Luc Gervais, a co-author on the study. "They're very complex systems; this makes them less easy to use by non-trained personnel - and it makes them a lot more expensive to manufacture," Dr Gervais told BBC News. Instead, the new device exploits capillary action, the tendency of fluids to climb through narrow channels - the same phenomenon that drives water into a sponge placed on a wet surface. The speed with which blood is drawn through the chip can be controlled by the design of the micro-channels on the device. 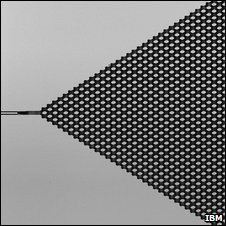 Those channels can be designed with incredible precision on a silicon chip - something with which IBM has significant experience. The microchannel-patterned chip is then sealed with a special polymer called polydimethylsiloxane, to which the "detector" antibodies easily bond. Different antibodies can be placed in a number of distinct channels, making it possible to diagnose a range of different diseases simultaneously. Such wide-ranging studies can be done in large analysers, found in the central laboratories of hospitals. "Typically you'll take a couple of millilitres of blood, send it to the central lab and it can take up to an hour or even more to get the results," Dr Gervais said. "In our case you can get a quantitative analysis of the patient's blood within just a few minutes at the bedside of the patient." What is more, it can be done with just a few microlitres of blood - a thousand times less - an amount that could be collected with a prick of a finger instead of a syringe. While the approach will make diagnosis cheaper, co-author Emmanuel Delamarche said the key aspect of the approach is its speed. "We are giving back precious minutes to doctors so they can make informed and accurate decisions right at the time they need them most to save lives."